IROKO Theatre Company is a registered charity that was founded in September 1996 by Alex OMA-PIUS. Alex trained as an actor and director at The National Academy For Theatre and Film Arts (NATFA), Sofia, Bulgaria. He has worked extensively as a performer and director and his credits include work with the BBC and the Royal Shakespeare Company. 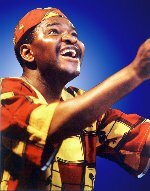 Alex formed IROKO in order to enhance the understanding and appreciation of African culture and arts, amongst society as a whole. The Company's primary aim is to advance the education of members of the public in the arts and in particular but not exclusively in African arts and to use traditional African theatre art forms as a vehicle for facilitating learning and self-development particularly amongst children and young people. IROKO's fundamental principle is that its work should have a meaningful effect in the lives of the young people involved: it should educate, empower, motivate and inspire them and at the same time, it should be fun. A Management Committee, the majority of whom are experienced in working with children and young people and have extensive knowledge of African arts and culture, oversees IROKO. The Company has a core group of performers and workshop leaders and has a full-time Administrator. The Guardian Newspapers’ Charity Award: For its "innovative approach to education", IROKOTheatre Company received national recognition when The Guardian Newspapers presented it with its highly prestigious "Charity Award". The Award is aimed at raising the profile of small charities. NatWest Community Involvement Award: For its "outstanding contribution to the local community", IROKO received the NatWest and South Essex Group of Newspapers "Community Involvement Award". Community of Health Award: IROKO has been recognised by the NHS as a Community of Health organisation for its ‘outstanding services in improving the health and wellbeing of local people’. Afro-Hollywood Award: for 'outstanding contributions to African heritage in the Diaspora’.